Our appeal of the trial court ruling will be heard in the 1st District Court of Appeals on Thursday, January 15, 2015 at 9:00am. The address is 350 McAllister Street in San Francisco ( DIRECTIONS ). The appeal was filed on April 2. All parties finished submitting their briefs on August 18. To see all of the important court documents, click here. Since court dates are frequently changed at the last minute, please check this site for updates. On April 2, 2014 our attorneys, Dan Siegel and Michael Siegel, filed the opening brief in our appeal to the California Court of Appeal for the 1st Appellate District. The issue in the appeal is whether or not we are entitled to a trial in Alameda County Superior Court. In September, 2013, the trial judge upheld the other side’s objection (“demurrer”) to holding a trial. The Secretary of State (the defendant) and Abel Maldonado, et al (the interveners on the defendant’s side), will each file responses in the next 60 to 75 days. We will then be able to file a final reply brief. After that, we will await scheduling of oral argument in front of the 1st Appellate District court in San Francisco. This article was first published on September 6, 2013 at Ballot Access News. Reproduced by permission of the author. On September 5, Alameda County Superior Court Judge Lawrence J. Appel upheld California’s top-two primary system, which has been in effect starting in 2011, and which is also known as Proposition 14. The case is Rubin v Bowen, RG11-605301. The case had been filed by the Green, Libertarian, and Peace & Freedom Parties. The decision can be read on the Court’s web page, but at this time no link is available. Update: the decision is now posted here. The decision relies entirely on dicta in the U.S. Supreme Court decision Munro v Socialist Workers Party, issued in 1986. In that case, Washington state had a blanket primary, and said no one could be on the November ballot unless he or she polled at least 1% in the blanket primary. The holding in that 1986 case was that the 1% vote test is constitutional because the Court had already upheld petitions as high as 5%, and the Court felt that “the differences between the two mechanisms” (the petition method and the primary vote test) are not significant. A hearing on two motions to dismiss our suit without a trial will be held on Monday, June 10, 2013 at 9:00am. The address is 1221 Oak Street, Department 16, in Oakland ( MAP ). The requests to dismiss the suit (the technical name is “demurrer”) were filed on March 11 by defendant Secretary of State Debra Bowen and by a group of intervenors in the case led by former Lt. Governor Abel Maldonado. We filed our reply on May 21. All of the documents are linked here. On Friday, June 7, Judge Lawrence John Appel issued this tentative ruling denying the request to dismiss with respect to our ballot access claim, and granting the request to dismiss with respect to our equal protection claim. The tentative ruling means that a trial is needed to judge the ballot access claim. For an analysis of the tentative ruling, see Ballot Access News. The hearing on Monday morning is an important one. This is an opportunity for the other side to persuade the judge to change his mind (and for our side to persuade him that his tentative ruling should stand). Those in the Bay Area should attend if they possibly can. The trial itself is tentatively scheduled to start on February 18, 2014. On January 4, an Alameda County Superior Court held a status conference in Rubin v Bowen, the lawsuit in which the Peace & Freedom, Libertarian, and Green Parties challenge the essence of the California top-two system. The judge set another status conference for March 4, and said he is working very hard on an opinion as to whether the case should be dismissed. That opinion will be released before January 29. Updated January 25, 2013 — The opinion, sustaining the defendent’s demurrer but granting leave to amend on two of the four causes of action, is here. Our constitutional challenge to Prop. 14 costs money. 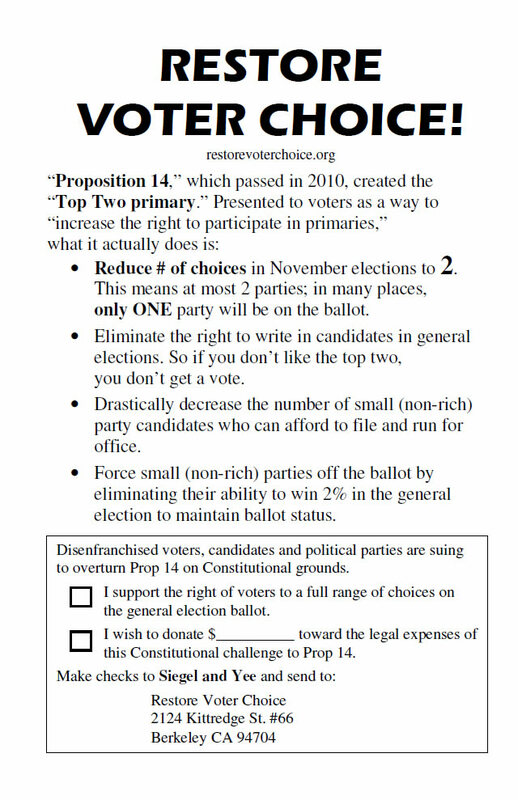 Support the right of voters to a full range of choices on the general election ballot. Donate now to help us cover our legal expenses. Please download, print and distribute this flyer. At a hearing in Alameda County Superior Court on October 29, Judge Lawrence John Appel appeared likely to order a trial on the merits of our case. We will post the actual order as soon as we obtain it. Ballot Access News has a detailed report on the hearing here. The next court date is set for Friday, January 4, 2013, at 9:00am. The address is 1221 Oak Street, Deptartment 16, in Oakland. Although this is a purely procedural hearing (called a “case management conference”), it is still good to have supporters in the courtroom. Since court dates are frequently changed at the last minute, please check here for updates. Click on the image to download, print and distribute our flyer. Prints two copies per sheet of letter paper.